Mounting challenges to the world's rice crop, from insufficient yields to climate change, are engaging the international scientific community. Some solutions are on the horizon, thanks to work by researchers from across disciplines at Cornell, who are weeding through the past to ensure this vital crop's future. That past is embodied in wild rice strains, which are the ancestors of cultivated rice, but until recently rice breeders would never have dreamed of crossing these progenitors with cultivated rice. Wild rice strains are considered weeds with undesirable traits – for example, they hold just a few, thin reddish seeds that easily fall off their panicles. But when Cornell plant geneticist Susan McCouch identified yield-related genes from a type of wild rice, and her collaborators at the National Rice Research Center in Stuttgart, Ark., bred those wild yield genes into a widely planted U.S. long grain called Jefferson, the resulting offspring was a sturdy new variety that withstood the onslaught of Hurricane Ike in 2008 while outperforming the Jefferson parent's yields by a whopping 20 percent. Collaborators in China, Indonesia, Brazil, Korea and Sierra Leone have had similar results with their varieties, breeding in favorable yield alleles (gene variants) from wild rice and getting 15 to 20 percent yield advantages in field trials all over the world. 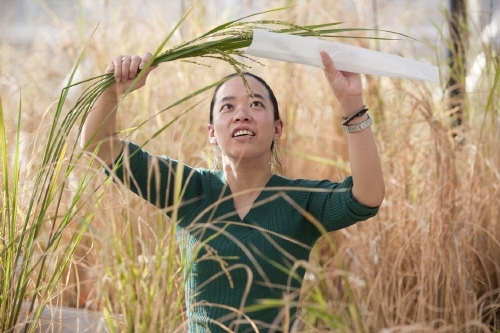 The findings are key, for they point to a strategy for preventing future global food shortages: exploiting the genetic variation found in these ancestors of cultivated Asian and African rice to breed entirely new varieties that address a litany of looming challenges. McCouch, a Cornell professor and a world expert in rice genetics, could not do this innovative work without the aid of plant physiologists, geneticists, computational biologists, agronomists and engineers. Collaborating across disciplines, they play a role in developing and making publicly available genomic technologies and knowledge that breeders can use to accelerate their work of developing rice with increased yields under drought conditions or that withstand high temperatures or absorb nutrients more efficiently so crops may grow in poor soils with little fertilizer. 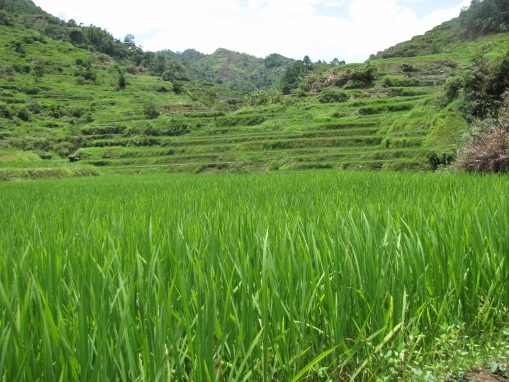 A view of the 2,000-year-old Banaue rice terraces in the Philippines, one of the destinations visited annually by Cornell students enrolled in the Rice: Research to Production summer short course at the International Rice Research Institute. This is a major example of how universities like Cornell are turning to their highly talented faculty to apply their expertise across many disciplines to help solve some of the world's most serious problems in energy, food production, the environment, human health and poverty. "We have a university that allows us to work effectively across disciplines and recruit some of the most talented people in the world," says McCouch. "We recruit great talent and provide a fertile environment for people to work together on novel applications that can make a difference in the real world, even in a rice paddy. And that kind of innovative environment is something that in many parts of the world you don't have access to." Nor does this pipeline end at Cornell. To supply rice breeders with modern tools and the knowledge needed to discover genes in exotic rice collections that will confer desirable traits, McCouch partners with researchers and breeders in public, governmental agencies, private companies and universities both domestically and in rice-growing countries in Asia, Africa and South America. Rice is the staple crop for more than half the world's population, including the majority of the world's poorest, providing more than one-fifth of global calories consumed. But it will have to be grown differently to meet the caloric needs of a global population that is projected to hit 9 billion by 2050, McCouch emphasizes. Rapid climate change poses additional hurdles, as heat, drought and lack of fresh water will require people to rethink how rice has been grown for thousands of years. "There's a global imperative to double the production of cereal crops in the next 20 to 50 years," says McCouch. Using the modern tools of cutting-edge genomics to access and track ancient variations, breeders are developing new varieties in just a few years, as opposed to a dozen years that traditional breeding methods required. Nor is this using the tools of genetic engineering, involving the insertion of genes from any species into an organism. Instead, McCouch uses traditional methods, where breeders mate or cross sexually compatible species and then select favorable offspring. The green revolution of the latter half of the 20th century improved rice yields by two to three times over traditional rice varieties while tailoring plants to grow under very specific conditions of irrigation using large applications of synthetic fertilizers and pesticides. This system, it's now realized, harms the environment, is too expensive for poor farmers and requires the use of diminishing supplies of costly fossil fuels. As a result, rice today faces a number of challenges. The future will require crops that produce more grain on less land as human populations encroach on arable farmland. Already, 30 percent of the world's total land area is inadequate for crops due to the triple threat of soil acidity, aluminum toxicity and phosphorus deficiency. As climate changes projected for this century bring heat and precipitation shifts, and as humans draw more and more water out of underground reserves, lack of fresh water will soon force rice growers to abandon the paddy system that has controlled weeds for thousands of years. Why, then, not use herbicides and genetically engineer rice to withstand the chemicals? Ineffective, because the major weed in a rice field – wild rice – is sexually compatible with the crop, so genes transfer immediately to the weeds, making them also herbicide tolerant. Instead, breeders must develop new rice that grows in dryer soils, with deeper taproots that search for scarce water, and shoots that use water efficiently within the plant. 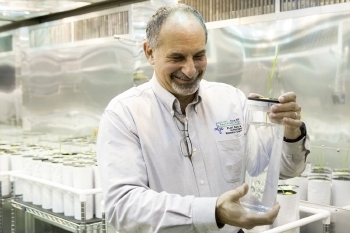 "We need to understand the entire root system, and the way roots take up nutrients and water, as part of that big global picture," McCouch says. With these problems, and with a narrow window of time, researchers across several disciplines must turn to a new agricultural revolution, learning to combine genes in new ways and taking advantage of the power of genomics to do so efficiently. There are 22 different species of Oryza, the genus we call rice; and of those, two were independently domesticated, one in Africa (Oryza glaberrima) and one in Asia (Oryza sativa), likely in the Yangtze River Valley, around 10,000 years ago. Early farmers selected the obvious, visible traits they desired, saving seeds from plants with upright stems, quick growth, larger, aromatic, flavorful grains, and seed hulls that didn't shatter for harvesting ease. But once they made such selections, they rarely went back and mixed their domesticated rice with the wild rice to see what other useful traits might be garnered. As a result, today's cultivars hold a small subset – perhaps around 40 percent for Asian rice – of the variety of genes available in their ancestors. Oryza rufipogon, the wild ancestor of Asian rice that McCouch and her colleagues work with, comes in hundreds of different forms. All are low-yielding with thin, red grain; some types are small and upright; others are eight feet tall and put out horizontal stolons – running stalks that root, break off and send up shoots in vegetative reproduction. Much of the genetic potential, such as the capacity to produce abundant grain yield, has long been hidden. But breeders can now begin to harness those hidden traits, thanks to researchers like McCouch and her colleagues. Based on two National Science Foundation grants (one for $6 million, the other for $6.9 million), McCouch is seeking to provide a research prototype that others can build on. The research entails developing genomic datasets and analysis tools to determine genetic variation at the DNA level in hundreds of thousands of diverse rice strains and wild ancestors, then using the information to identify genes of interest, understand what traits they confer, how they behave when crossed with cultivars, and to make this information available on a Web database for rice researchers and breeders around the world. The project will also provide purified seed stocks and novel collections of lines with specific wild genes bred into them, to expand the use of wild and exotic materials in fundamental research and for breeding new varieties. None of this work would even be possible without the help of gene banks and public agencies that collect, characterize and distribute seeds of cultivated varieties and strains of wild exotic rice. Among them are the U.S. Department of Agriculture (USDA) and the International Rice Research Institute in the Philippines – where Cornell has had strong ties since the institute's founding 50 years ago and where McCouch herself worked for four years after completing her Cornell Ph.D. in 1990. The West Africa Rice Development Association and Centro Internacional de Agricultura Tropical in Colombia also manage, use and distribute genetic resources to the public. These institutions are all longtime collaborators, helping to test and disseminate Cornell prototypes of technology, pre-breeding varieties and knowledge to local breeders. Researchers in Japan, China, India, Indonesia and Taiwan have also worked closely with McCouch to grow out and measure observable characteristics, called phenotyping, of existing varieties and breeding populations. At Cornell, McCouch works closely with plant physiologist and professor Leon Kochian, director of the USDA Agricultural Research Service's Robert W. Holley Center for Agriculture and Health at Cornell, to develop aluminum- and drought-tolerant rice and to identify and understand the genes that are responsible for these traits. In order to identify genes of interest, McCouch and Kochian evaluate single nucleotide polymorphisms (SNPs), points in the genome where there is a base pair change that makes one individual within the same species different from another. 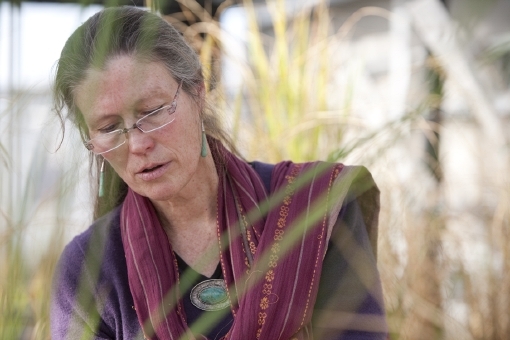 "SNPs are like genetic signposts that we use to figure out where a gene conferring a valuable trait resides along a chromosome and to track genes of interest in crosses between wild plants and cultivated ones," McCouch says. 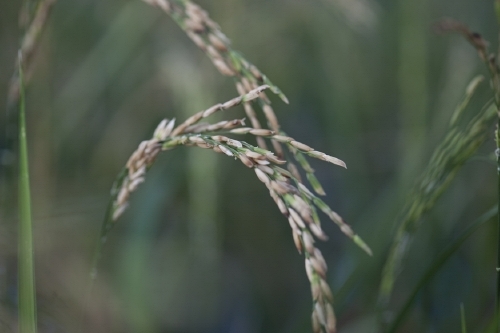 SNPs are identified by comparing the genome sequences of diverse individuals with a reference genome – the first completely sequenced rice genome from the Japanese sushi cultivar, Nipponbare. Through a $1 million USDA grant, McCouch's group and Cornell-partner Affymetrix Co. recently developed a 1 million-SNP genotyping chip that allows researchers to rapidly and efficiently analyze variations in thousands of individual rice plants and then analyze the data. Now a breeder can make a cross between two genetically different parents, evaluate the genetic composition of the offspring using the SNP chip and determine which genes of interest are in particular offspring. The result, after only three or four generations, is a new plant that contains a desired trait from one starting parent, but also looks and behaves in important ways like the other starting parent. Cornell also has the advantages of equipment, computing power and expertise to process vast amounts of genetic data on campus. The genotyping – identifying the makeup and locations of SNP variation and genes – is done at Cornell, with the help of Peter Schweitzer, director of the Genomics Facility in the Cornell University Life Sciences Core Laboratories Center. The raw data is provided by researchers in the McCouch lab from purified lines of rice they have grown. Eventually, terabytes of phenotypic and genotypic data will be analyzed in collaboration with computational biologist Jason Mezey, an assistant professor with an appointment in biological statistics and computational biology at Cornell in Ithaca and in genetic medicine at Weill Cornell Medical College in New York City. 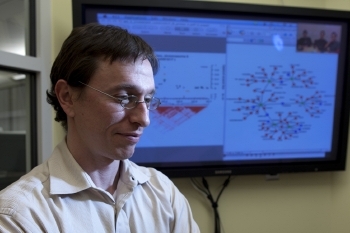 Mezey develops algorithms for answering questions in genomics and collaborates with medical researchers and plant geneticists alike to find the statistical evidence that a phenotype may be correlated with a genetic sequence. "If you have a characteristic with a complicated genetic basis, such as grain size, there are a number of genes where if you were to alter their sequence in the right way, you would be able to alter grain size," Mezey says. "Identifying these genes is challenging." "So this is the kind of thing we are developing bit by bit. Science is picking away, asking, 'what does this SNP do?' and 'what does that SNP do?'" says McCouch. 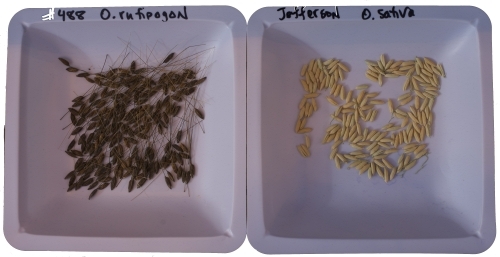 Eventually, a picture develops that shows how certain SNPs correlate with traits of importance in the world of rice breeding, such as resistance to blast fungi or tolerance to aluminum or drought. 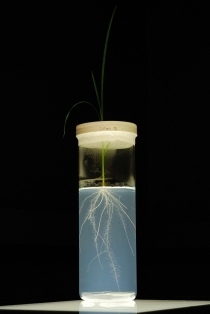 Many answers to breeding new rice varieties that could be grown in a non-flooded system (without paddies) or that could withstand drought or acidic soils with high aluminum toxicity may be found in the plants' roots and the genes that control root architecture. "If you wanted to enhance the ability to explore soil or increase mineral or nutrient uptake, you need to understand the root structure, because the roots are where it happens," says McCouch. "But people simply don't know much about roots." Janelle Jung, a chief plant breeding graduate student in McCouch's lab, and Randy Clark, a bioengineering graduate student in Kochian's lab, are working to characterize root architecture. 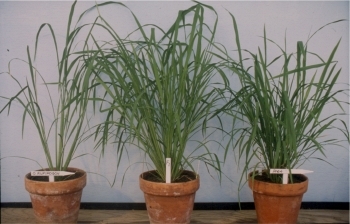 Jung has spent the last three years in Cornell's greenhouses growing a diverse set of a wild species that is ancestral to cultivated Asian rice and which is considered a noxious weed in the United States, and phenotyping their above-ground characteristics by measuring 20 to 30 vegetative and seed traits. 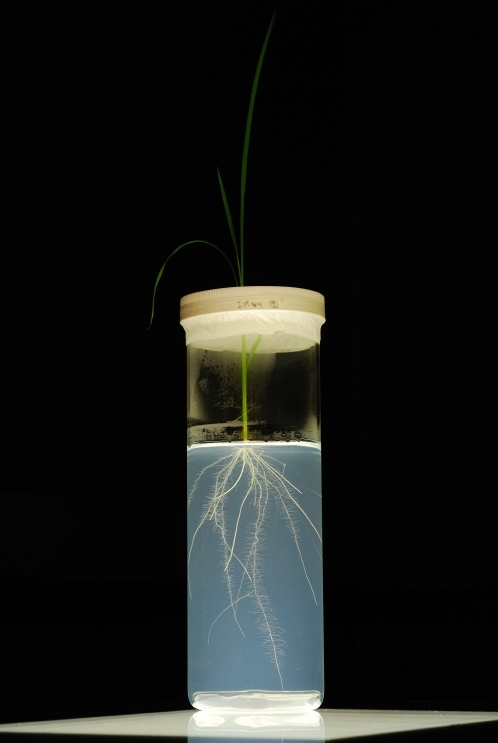 Using an advanced 3-D root imaging system and software package developed by Clark in Kochian's lab (see sidebar), Jung and Clark are investigating root architectures – deep and narrow taproots vs. shallow, spreading root systems. By comparing the root and shoot trait data from each plant with each plant's genetic fingerprint using the SNP chip, McCouch and Mezey's labs are able to make associations between traits and the genes underlying those traits. "We now have a chance to get at the genes that determine these different root architectures," McCouch says. Joshua Cobb, a graduate student in both Kochian's and McCouch's labs, is also using the genotyping power of the new SNP chips to understand the genetics of mineral and heavy-metal uptake in rice. Once he has all his data, he will try and identify what regions of the genome are associated with accumulation or exclusion of these nutrients, minerals and toxic metals such as arsenic and cadmium. "This has implications for human nutrition but also plant nutrition," says Kochian. Acidic soils affect half the world's potentially arable land, mostly in the tropics and subtropics. Aluminum in acidic soils becomes toxic to life and binds up phosphorus, creating phosphorus deficiency. "It inhibits root expansion and cell division, and you end up with a stunted and damaged root system that can't take up water and nutrients," adds Kochian. McCouch, Kochian and their graduate students have also used SNPs to identify genes from divergent strains of rice that confer greater aluminum tolerance and have bred them into rice cultivars that are grown throughout the tropics. Soon, another McCouch and Kochian graduate student, Juan David Arbalaez, will take these new rice lines to Colombia and Indonesia where he will test them in the field for aluminum tolerance under naturally acid soil conditions. McCouch also has begun collaborating with Cornell agronomist John Duxbury and Bangladeshi soil scientists and rice breeders to identify SNPs related to arsenic tolerance, aiming to reduce arsenic uptake in rice in Bangladesh, where the toxin exists naturally in soils and taints groundwater. Above all, McCouch stresses that her role is not to produce new, finished varieties of rice, but to give breeders the genomic tools, strategies and enhanced varieties they will need to ensure an abundance of this essential crop by midcentury. "We are working against time to enhance both the productivity and the sustainability – or the resource-use efficiency – of rice production," she says.